CALLCARE deliver a bespoke telephone answering service from our call centres in Manchester – focusing on around-the-clock customer support across the whole of the UK. 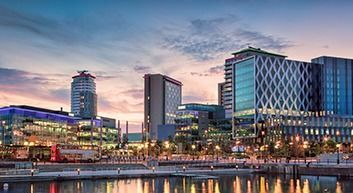 As Manchester continues to grow and thrive as an economic hub in its own right, more and more businesses are choosing to base themselves here. There’s something friendly and comforting about a local accent, and making your clients feel at ease is what customer service is all about. As well as having an outsourced call centre in Manchester, we also operate across several locations in the UK and can provide a reliable and efficient telephone answering service that is perfect for your needs. One of our friendly operators will answer every incoming call to your company and either divert the client to the relevant employee, where appropriate, or take a message and email it directly to your company. Having built up an impressive reputation for our call answering services, our Manchester-based clients have commented on how beneficial it is to have a 24/7 emergency response service to handle either urgent enquiries or simply to have calls answered around the clock, and our friendly operators can do just this. CALLCARE ensures your customers always have their calls answered and provide you, as an employer, with the reassurance that you are not missing any potential business opportunities or messages. Order lines are also an option we offer, allowing any orders or appointments you receive to be recorded and allocated efficiently, even when your staff are not at their desk to answer the call. Why Choose Outsourcing for Your Customer Service Needs? Call centre outsourcing is not just about answering calls. We can also assist your company with marketing activities such as outgoing calls to conduct surveys or to inform your contacts of an event you might be running. Our dedicated response lines can effectively evaluate any calls generated through marketing and advertising activity. This service is unique and we work with you to create the best solutions for your company. For those looking for a competitive edge, having an efficient service allows you to focus on more pressing business activities with the reassurance that every single call is answered and managed professionally, with minimal disruption to you and your staff.